Let the Gucmatik Work for You. Make a deal with businesses to share your gain to half by half with Gucmatik and make a profit. 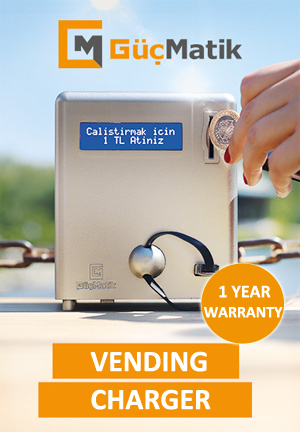 Let the Gucmatik charge machine work, you count your money! By agreement about sharing 50% of the profit with businesses, leave your machine, let the business run for you! You can start to earn money from your nearist cafe by leaving Gucmatik. - Cafe, restaurant, tea garden, hookah cafe and all outdoor places. Increase your earnings with a small amount of investment. You have a small amount of money and think about how to evaluate it in your mind and you cannot find an answer, Gucmatik comes for you. All you have to do is start with small investments to leave the Gucmatik to the cafes, and then share the money half by half with businesses. You can regain your investment in 4-6 months at a business with being in average demand and Gucmatik would completely work for you in the following process. Low Effort, Constant Income! 75 € Campaign is limited in stocks. To earn extra income and happy customers contact us.